In the District of Columbia, the growing green movement has not benefitted all of its residents equally. The poorer groups of people that have been historically marginalized and disenfranchised are the ones that have the least access to clean energy and sustainability. Recognizing the importance of religion in these communities, DC’s green movement is beginning to reach out to these communities with faith-based initiatives that help churches be the forefront of the green movement. Some recent successes include the Florida Baptist Church and the Green DMV’s Green Faith Initiative. The Florida Avenue Baptist Church is a longtime fixture in the District, sitting on the same corner in LeDroit Park for the last 99 years. 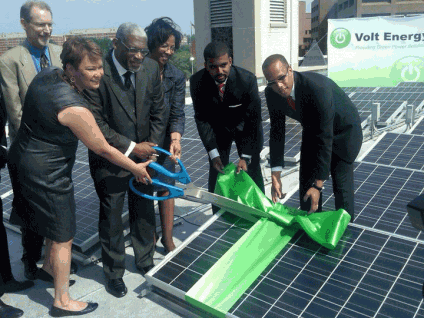 In April, it became the first black church in DC to rely on solar power. This is a huge step in helping the African American community benefit from the green movement because black churches have always played a big role in social change in black communities. Black churches played a huge role in the civil rights movement in the 1960s, and hopefully Florida Avenue Baptist Church can begin a much-needed similar movement for green energy in the black community. A 2010 report by the Center for Social Inclusion found that African Americans spent more on home energy bills than Latino and Asian Americans and significantly more than white Americans. This is because, as a general rule, African Americans live in older, less energy-efficient homes with older appliances, resulting in higher energy bills. In addition to this, African American communities tend to be located in poorer areas near smoke-belching coal-burning plants. Now, with the new solar panels, the church’s pastor is looking forward to not only saving money, but reduce their usage of dirty energy and establish a “green ministry” that will educate his churchgoers (and hopefully others) about clean energy. An important first step in establishing his green ministry is coming soon in the form of a new monitor that will display the amount of energy being produced and the money being saved by the solar panels. For more details, read the Washington Post article here. 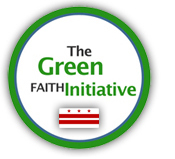 In late April, Green DMV launched the Green Faith Initiative with a grant from the District Department of the Environment, and along with it began many faith-based events for churches to bring knowledge of sustainability and environmental stewardship to their communities. The Green Faith Initiative also included a raffle to select three churches that would each get $30,000 to become more energy efficient. The money would go towards energy audits and energy efficient improvements; the lucky three winners were the Good Success Christian Church in NE DC, Miracle Temple Non-Denominational Church in SE DC, and Metropolitan AME Church in NW DC. All the details are here. – Greening Our Sanctuaries: An Interfaith Workshop and Expo– Learn how sanctuaries are utilizing their own spaces to form vegetable gardens, save energy, and partner with other faiths in an effort to unite the same cause. Sunday, July 17th, 1:30-5 at Adat Shalom Reconstructionist Congregation in Bethesda in partnership with Greater Washington Interfaith Power & Light. A suggested donation of $10 at the door will benefit our work with congregations. For more details and to register, visit http://uusj.net/wp/?p=3155. – Green Sermon from Sara Emmerich, M. Div– If your pastor is on a leave, Sara Emmerich would love the opportunity to be a guest speaker to discuss her sermon, “On Earth as it is in Heaven,” which link s environmental values with Jesus’ text. To “book” Sara to offer this sermon in your church on a Sunday this summer, email joelle@gwipl.org. Suggested honorarium: $50.